Can see that back, handset, and Swiss made on other 1191s, e.g. Better photo could tell if stamped or not. Serial number is 1960. The red sweep makes me think it would be early 70s maybe, during the crazy days of using up old parts? Question would be "Which period" though. Last edited by buddman on Sat Jun 03, 2017 7:20 am, edited 1 time in total. The case is chromed so the inscription is correct. I would expect a dial from the period to have no "T" either side of the Swiss made. The logo and 1191 look stamped to my eyes(photo attached). Thanks for taking the time to debate my watch. I think it might. E difficult to prove this either way. And why does it matter what happened at Omega? My 1969, 1990 and 2002 all do. I only mentioned Omega as I know they have that feature and they don't make their own dials. Who made Breitling dials? Serial number for your case is ~ 1960. I know as those are the only dials to have in front of me but have photos of dials from as far back as 1958. I have no issue with the case or movement, it should have a signed crown but I can't see it (commonly replaced anyway). The perceived issue with the sub register printing is all too common on reprinted dials (and the first place I look when I have suspicions) and I have seen reprinted examples where the Breitling printing on the dial is almost like original except a little larger. 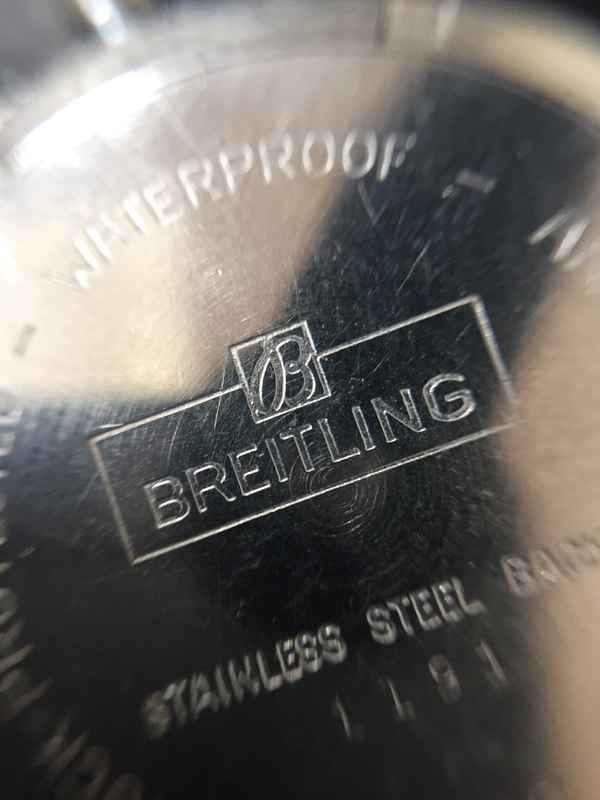 I looked for another original vintage black Breitling dial with printing on the sub register curve and couldn't find one. in the countryside w/ bad connectivity, will comment in depth on Tuesday - could the dissenting opinions please provide correct examples of very late 50s 1191 ? The case is chromed so the inscription is correct. I would expect a dial from the period to have no "T" either side of the Swiss made. The logo and 1191 look stamped to my eyes(photo attached). Thanks for taking the time to debate my watch. I think it might. E difficult to prove this either way. Would it not be a "red flag" if a dial from the early 60's did in fact have "T's"? It is my understanding that they weren't used until around 1963. Sorry if I come across as argumentative I did buy the watch assuming it was a redial (poor photos), I'm happy with it either way but would obviously be very happy if it turns out to be genuine. 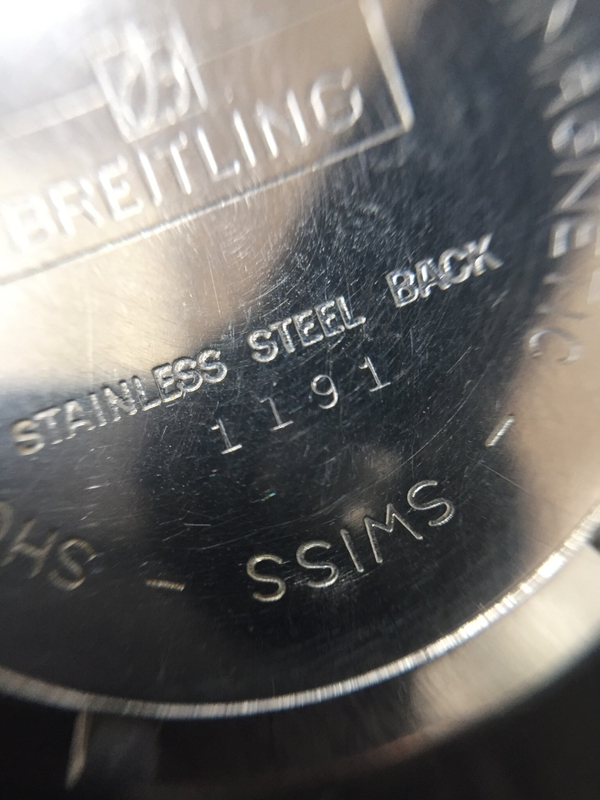 Tritium marking on a 1960 dial, René ???? that would be a sure indcation it was incorrect ? so you're saying its radium ? white radium on a non-waterproof watch ?